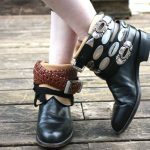 I’ve been on the fence regarding these boots for awhile because to me, they fall into what I call the “split personality” category: where something looks totally different from the front as it does from the back or the side. These shoes look so chic from the front – but from the side I always felt the heel was a bit too low and clunky-chunky. 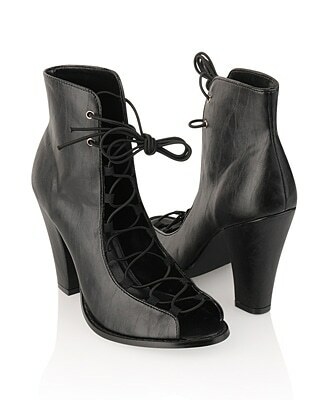 I just wasn’t into the shape of it – but still wanted a pair of open-front booties for the warmer months of summer. 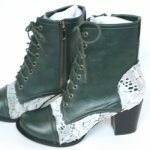 I was planning on doing a DIY of this style by just buying a pair of boots which had the pieces anchoring the laces separated a bit, with a single piece of material as the toe-box and tongue. 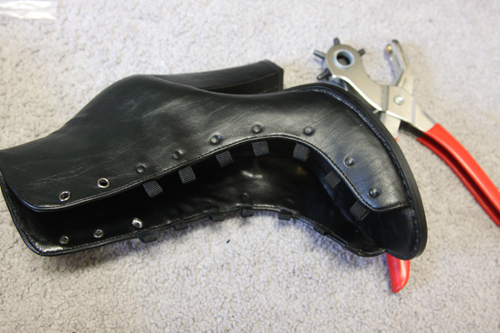 (All you would need to do is cut out the tongue and toe box, leaving the sides and laces intact.) But even I’m a sucker for a cheat – if there’s an easier way to do something, I’m all for it! 1. 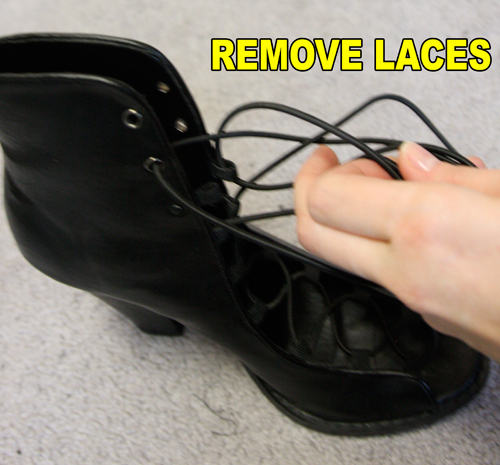 Remove laces from the shoes. 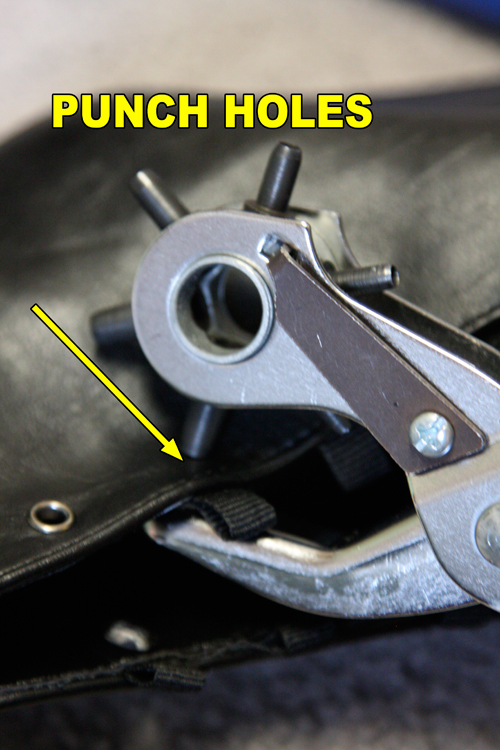 Using the rotary leather punch, punch holes in the shoe leather about 1/4″ from the edge, where each ribbon lacing anchor is located. I used the second-largest punch on the rotary. 2. 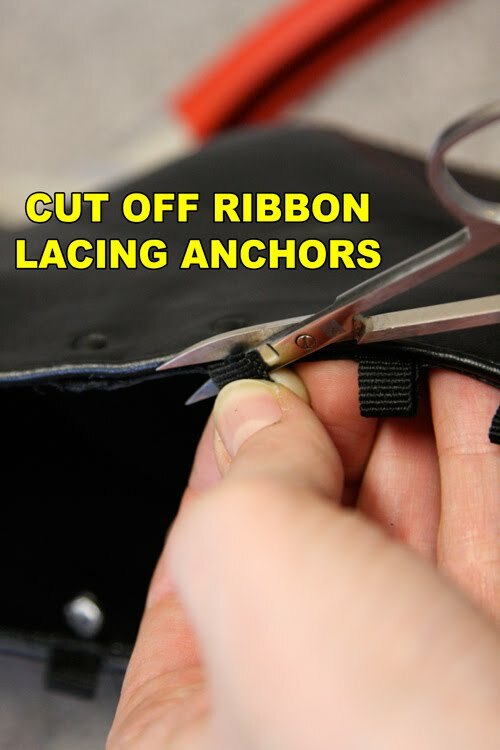 Use the small scissors to cut out all the extraneous material that wasn’t punched out of the holes by your pliers – there’s a couple layers to go through, including the outer vinyl, inner lining vinyl, ribbon ends, glue, and in some cases, the inner buckram stiffener, and usually, the pliers can’t handle it. 3. 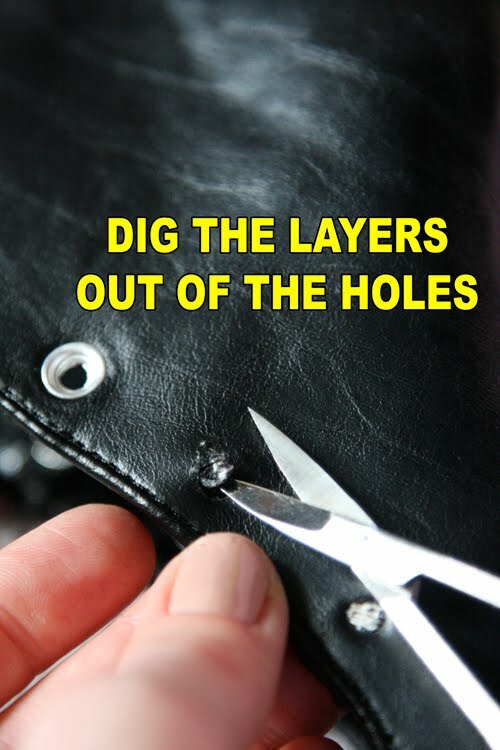 Use the scissors like an awl, and twist them back and forth in the holes to stretch the holes a little larger. 4. 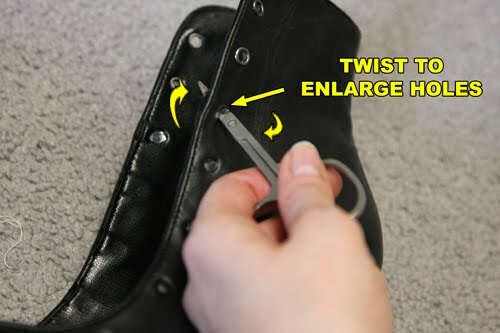 Use the scissors to cut off the protruding ribbon ends – what the Forever 21 boots used as lacing anchors for their laces. 5. 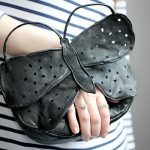 Set the eyelets (or grommets!) in each hole. Since the eyelet plier setter is a sucky piece of equipment, and the eyelets are equally sucky, I had to go back in with pliers and press down the backs where the eyelets split, leaving jagged metal edges. 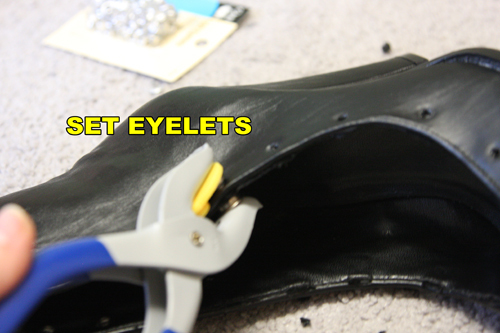 If you’re using better-quality tools and eyelets (i.e., not Dritz brand) you probably won’t have this problem. 6. Thread the laces through the eyelets in a zig-zag pattern. Wear proudly! They’re pretty darn good doppelgangers, and the heel is now a little more tapered and chic. Not feeling very photogenic today. Boots worn with Norma Kamali All in One Jersey dress and DIY’d sheer tights. DIY gray pedicure from this post. And Lil Tot was so enamored with them that he wanted to pose wearing them as well. Not sure why his pants are undone. He doesn’t seem to like pants much, considering that the few times I’ve shared his photo on this blog he’s pantless. P.S. And if I never have to spell “Demeulemeester” again, I will be one happy lady. ;-) That, and if I could just get Lil Tot to wear pants done-up for a photo op. 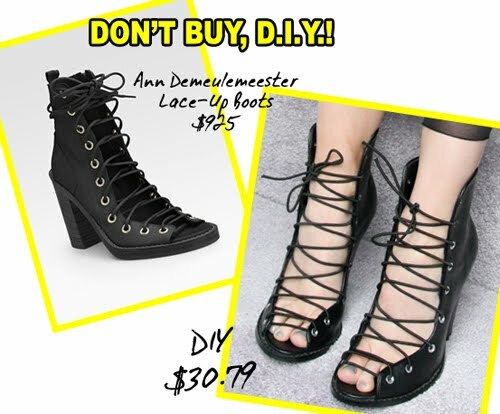 I am still on the fence about that style of shoe but killer DIY version! I think I am going to have to buy that dress.. I never look at clothes at WalMart, but that looks really cool. FAB, absolutelove love them. Wondering if maybe an old pr of 'army boots' might be redesigned like this! I love you DIY! LOL on little tot wanting to trot in them…reminds of when my son donned my shoes as a tot and would walk around and complain how “mean” the felt walking. I will never forget when he put a pair on along with with slips thrown around his neck and wearing straw at saying “I'M ET, I'M ET!” from when E.T. dressed in drag to avoid detection. It is one of my fav pics that I am not “allowed” to show to his friends as he is now a teen. @trashywriter: Sure, why not! 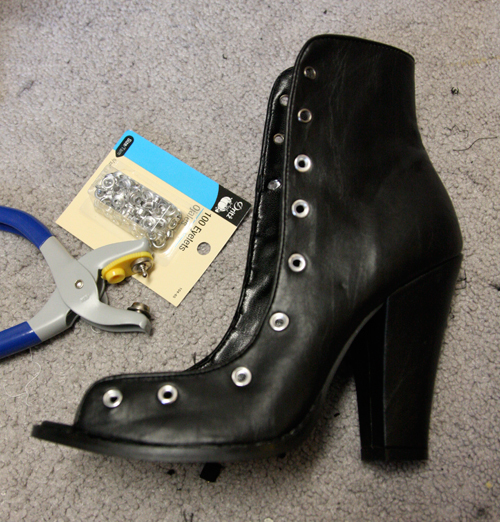 Just use a box-cutter to cut out the toe-box area (as long as it doesn't have a steel plate in it…tho I'd worry about the boot toe-boxes being heavy-duty and near-impossible to cut if they're super-authentic army boots…) But why not?! @Brandi: Actually my dress is from Spiegel.com when they were selling the Norma Kamali line (and $89 too!) I can't believe something similar for a mere $26 is at Wal-Mart now. *sigh* I can't vouch for the Wal-Mart version – it may be quite a different material – but the style looks exactly the same from the photos on their website! And you can wear the dress like a bajillion different ways…I wear it as a maxi-skirt often, and sometimes do the one-armed dress version. Nice DIY, and a great result. What can be better than highlighting the lacing against skin? One thing though: Do your shoelaces often come undone? I ask because it looks like you might be tying a “Granny Knot”, which is notoriously prone to coming loose. The tell-tale sign is that your bows don't sit across the shoe from left to right. 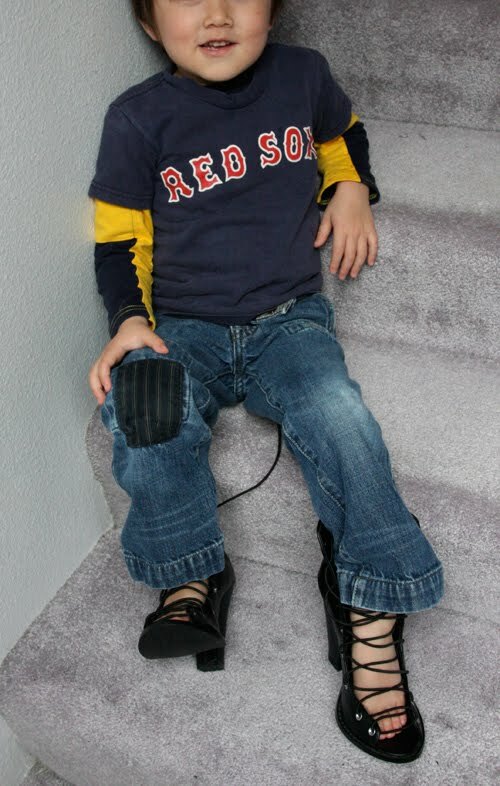 Check out the Slipping Shoelace Knots page on Ian's Shoelace Site for the explanation and ultra-simple solution. Girl! You are off the chain! I LOVE IT!